Rannô Ptáča is one of the Stur’s cafe branches. 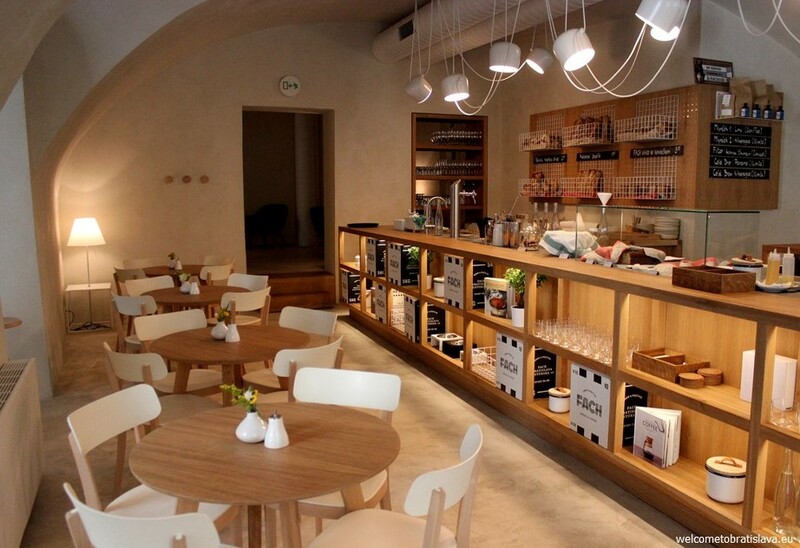 It has an identical menu PLUS a special, one of the most extensive breakfast menus we have found in Bratislava. And, breakfast is served here all day. One of the meals we liked the most so far and would recommend is the „chleba vo vajci“ which stands for a bread covered in egg, filled with ham & cheese. You can have eggs in 7 different ways, 7 kinds of omelets or breakfast specialties such as burrito or a „Russian egg.“ One interesting thing is that they serve „their special“ potatoes with all kinds of eggs. 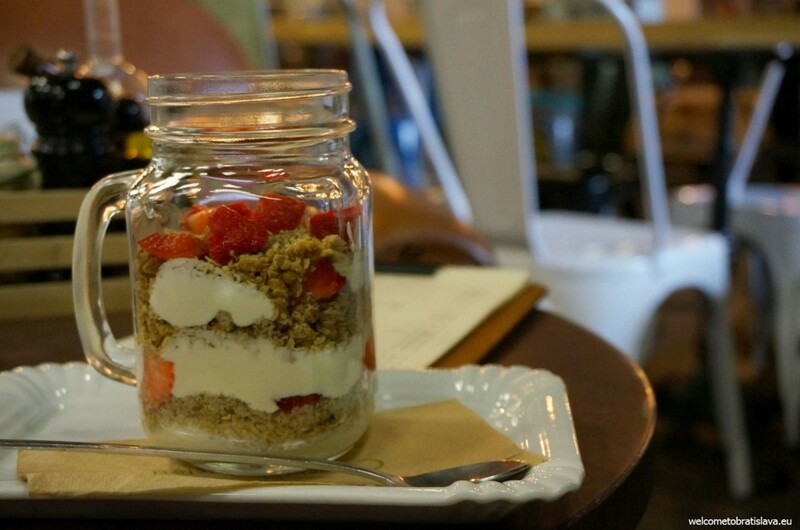 They have also a category of „healthy breakfast“ which contains a home-made granola with yogurt or milk (our favorite from their menu – the first picture below), porridge, semolina pudding or fruit salad. You might also find interesting that you can order soya milk instead of cow milk (with meals and also coffee) for just extra 0,50 €, and that you can have your pancakes made from a wholemeal flour as well for extra 1 €. (Btw as you can see, these pancakes are huge and come as two pieces – impossible to finish! They taste good but not as good as the ones in Moods Bakery & Coffee listed below). 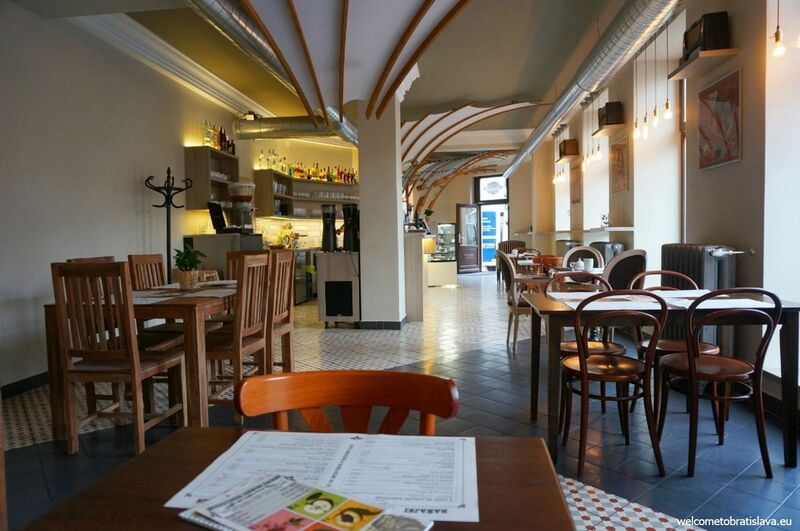 Rannô Ptáča is located near our main train station (10-15 minutes walk from the city center if you wish). Gatto Matto Bistro is a stylish multi-functional gem. Having a prime location on the Ventúrska Street, it can’t be missed when walking in the city centre. 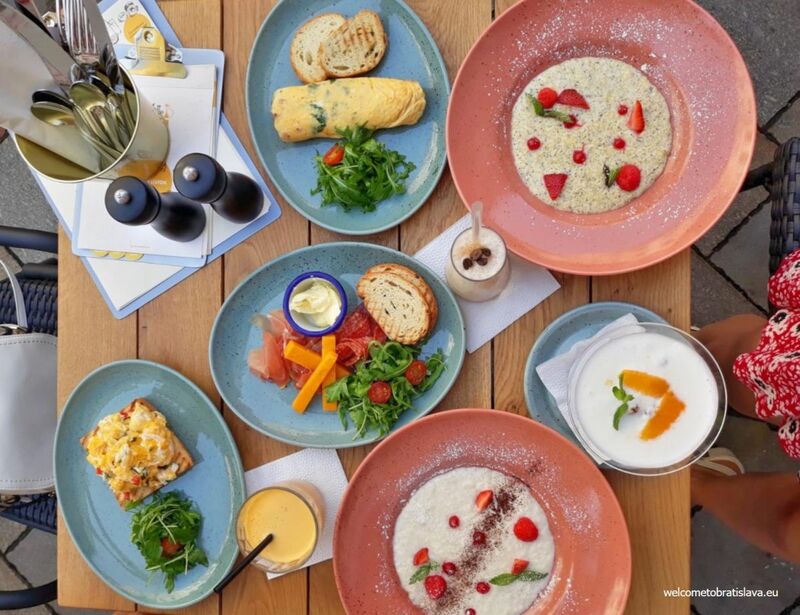 Stop at this vibrant spot for amazing breakfast while people watching on the terrace! The healthy options with a lot of vegetables, fruit and fresh juices will boost you for the rest of the day for sure. Our very favorites from the menu are the sweet porridge and yogurt mixes. But if you’re into salty things, you’ll be happy with the egg/salad/veg variations as well. Breakfast is served daily 8-11am. One of the best breakfast places in town. 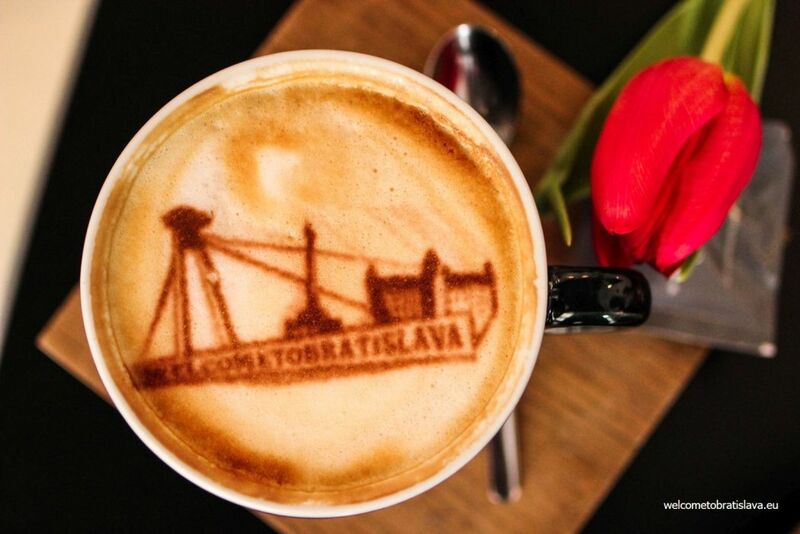 Delicious locally roasted coffee, the best American pancakes with maple syrup, perfect location in the heart of Bratislava, super friendly personnel. 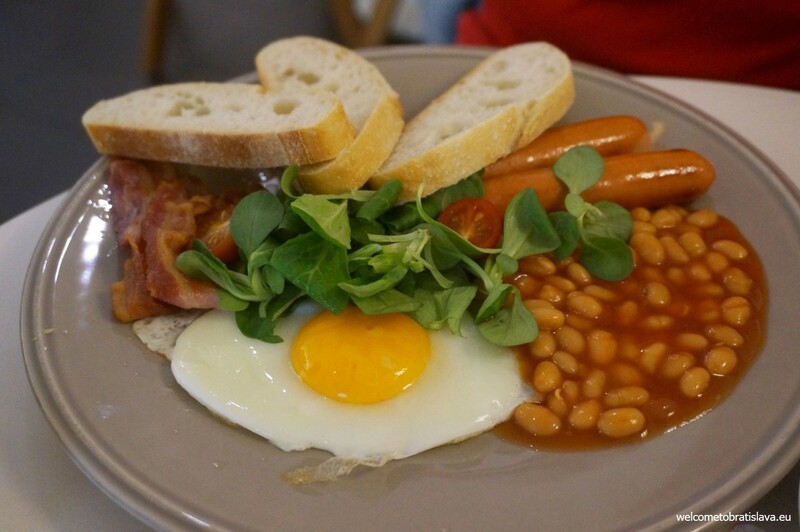 You can also order English breakfast – it would be perfect if they served different sausages with it. These tastes OK but are the traditional Slovak sausages („párky“). Their omelets are very tasty. And as a bonus you get a bowl of salad with everything your order. Moods Bakery & Coffee is very tastefully furnished, with wooden tables and chairs, simple lamps and shelves of bottles hanging on the white walls. We like that the seating is set up along the big glass windows, through which you have a great view on the square and the UFO bridge. 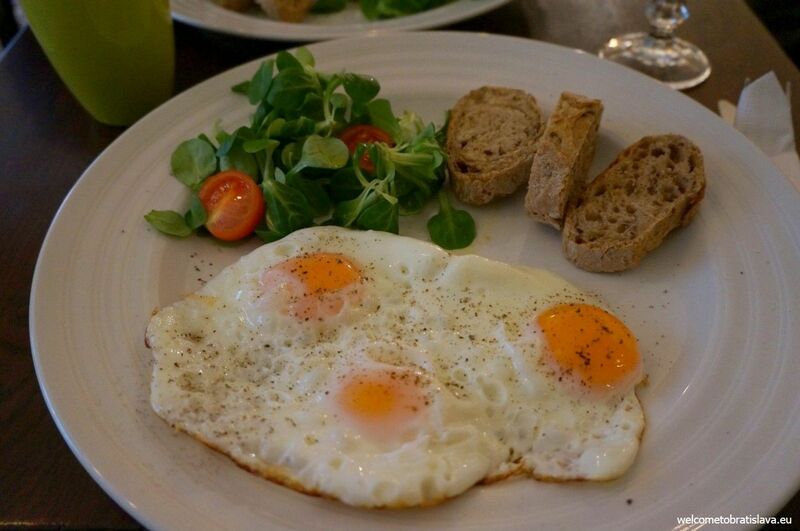 Mondieu has a breakfast menu which is served daily until 11:30. 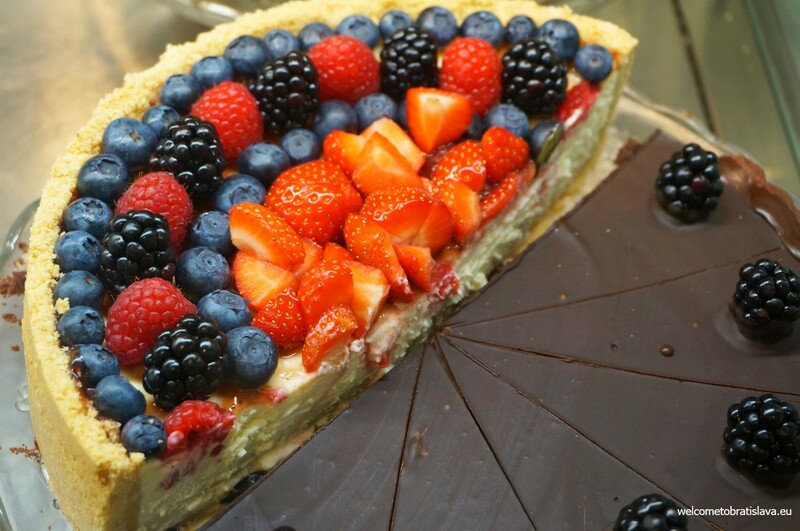 It is quite wide and whether you like to have a sweet or salty treat for your start of the day, you will be able to choose something tasty for sure. 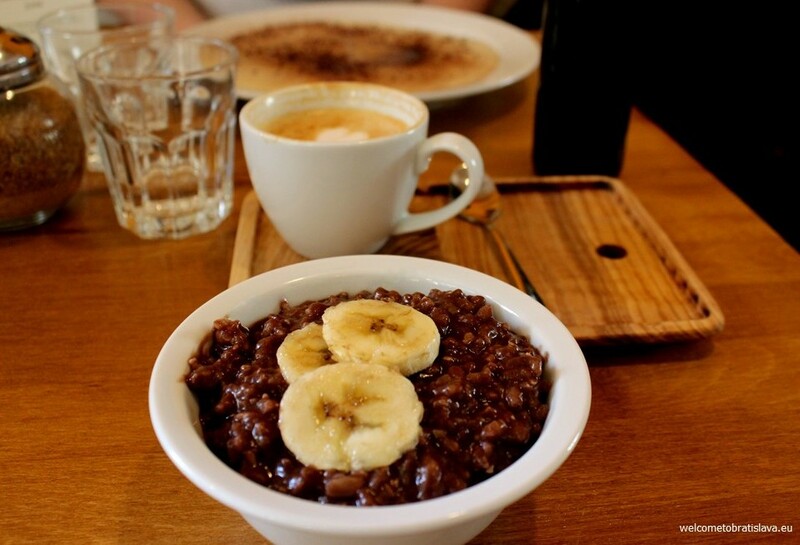 We definitely recommend the healthy millet porridge with coconut cream, prunes, banana, maple syrup, cinnamon and almonds. Topped with a strawberry. It is worth of waiting the 20 minutes preparation. Heavenly taste and as it is really easy to digest, you will not feel too filled even if you manage to finish it all (we didn’t) :) Home made muesli with yogurt, honey and fruits, sweet and salty croissants, eggs and various toasts are also served here. One warning: don’t order cappuccino – despite the good meals, we haven’t had a worse one than here. They have a big selection of sandwiches and cakes, too, which are not on the breakfast menu, but you can order them also in the morning. Mondieu is a very nicely looking place, with a lovely music and decor. Its big advantage is that it is open from an early morning. 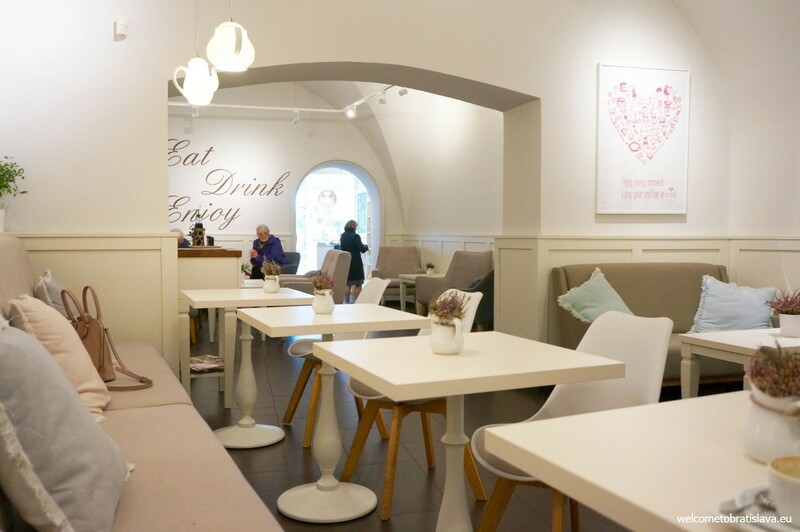 This cute little place located between the Old Town and the Castle serves a daily breakfast menu until 11:00. 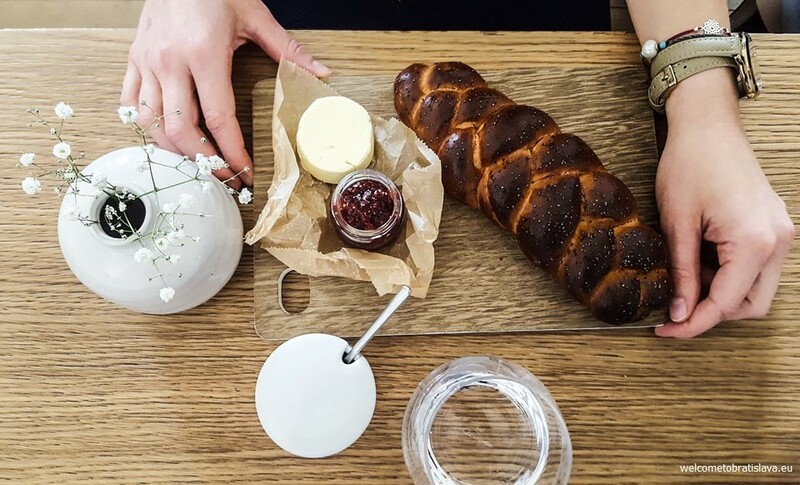 Each „breakfast package“ includes a coffee of your choice, a glass of 100 % fresh orange juice and then the third item is up to you – have a sweet croissant with jam or nutella, a salty one with ham & cheese, a baguette with ham & cheese or a bowl of yogurt, muesli and honey. Their breakfast menu also includes hummus with pita and olives but this one does not come with the coffee and orange juice. Anyway, they serve hummus all day long and it is nevertheless more of a lunch/dinner meal than something we would have for breakfast. 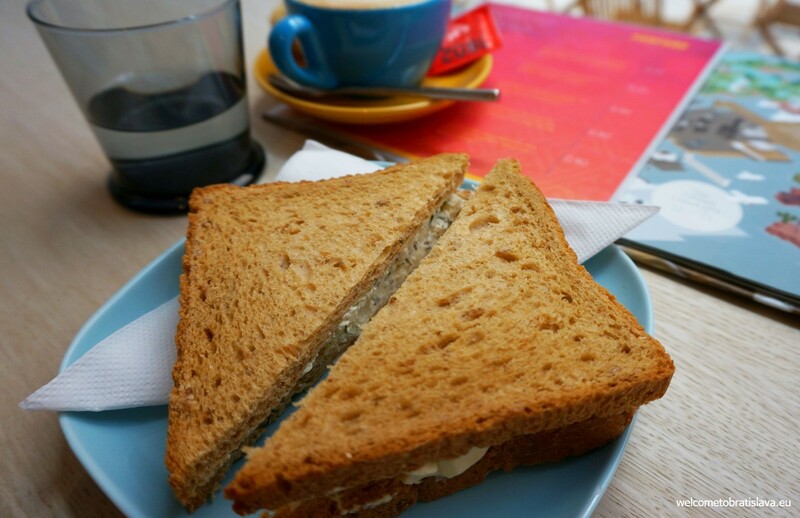 Both “urban” cafes that you choose for breakfast have some options which will not leave you hungry. 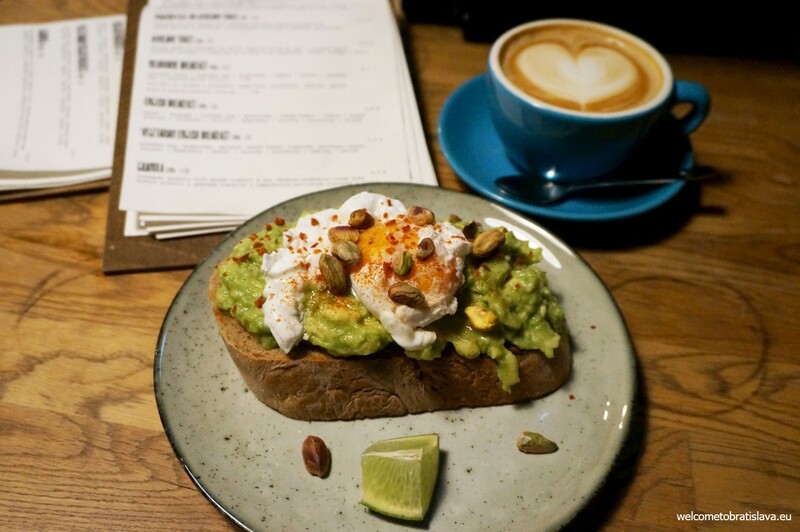 Urban House and Urban Bistro have almost the identical breakfast menu consisting of egg Benedict, English or Melbourne breakfast, poached egg on avocado toast, other toast or bruschetta options and yogurt with granola. Moreover, both cafes are really cool places to hang out at. Fancy a royal style breakfast? Kaffee Mayer will be something for you then. It is a place designed in a period style with big chandeliers, historic paintings and statues and classical music playing in the background. The mornings are slightly less busy than the rest of the day, that’s why we like to come here if we need some private time. You can have an omelet with mushrooms, scrambled eggs with onions, ham and eggs or a cold plate (selection of cheeses) here. 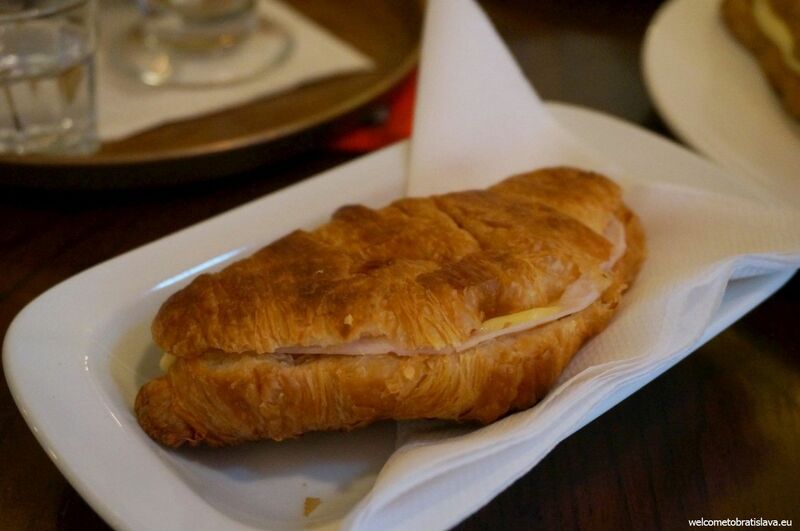 A plain croissant is also on the menu, we like to have it with the eggs. 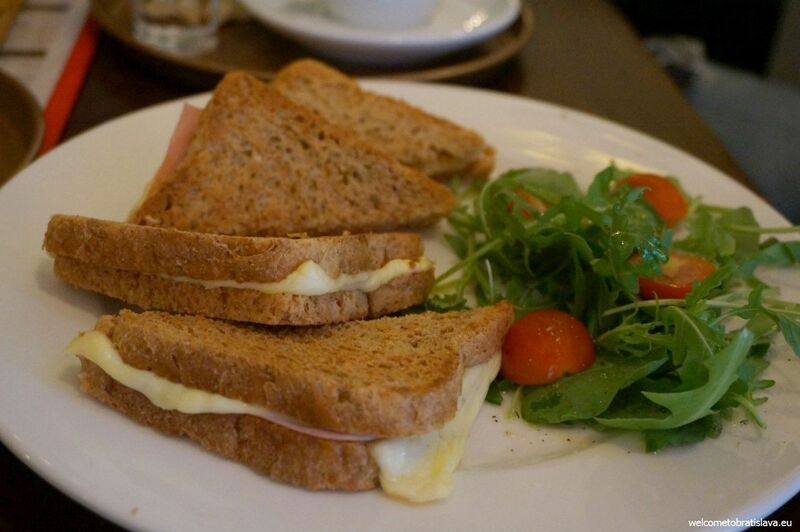 In case you don’t feel like having eggs, you can also have something from their sandwich or toast menu. 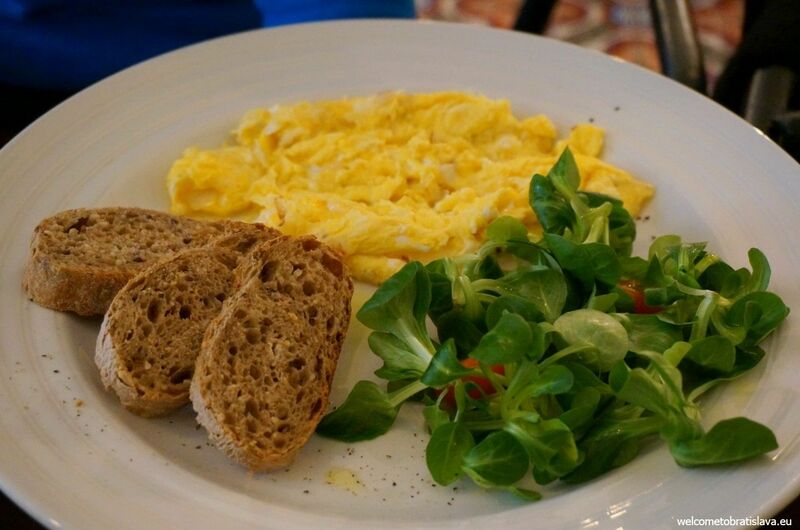 One tiny recommendation: if you like to have your eggs well done, tell the waiter prior ordering, otherwise you will be served a half-done version (such as on the first picture). As mentioned above, the whole place is very cute and romantic. This is one of the three main rooms of the cafe. 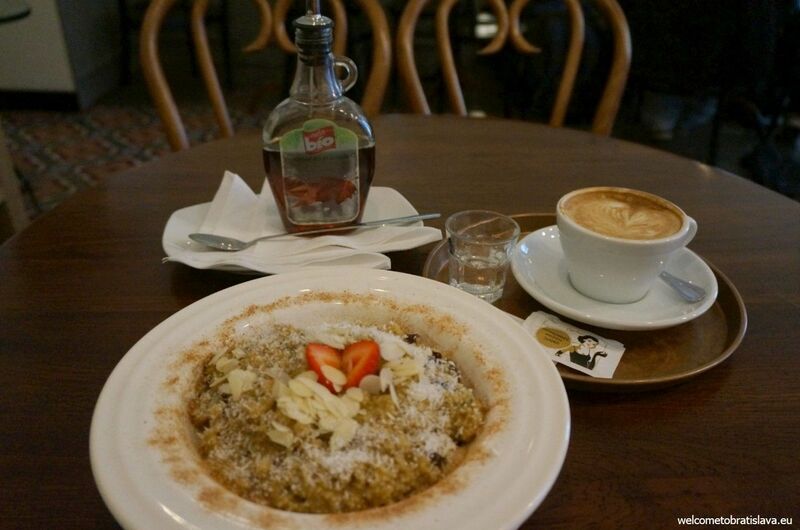 If you want to start your day at an industrial hip place, W Cafe is a great choice for you. The eating options are not wide but rather tasty. We have tried their breakfast offer of sausages with cheeses and vegetables and a raw coconut and wild berries cake, and really enjoyed both. If you like croissants, you can choose one with a chocolate or marmelade filling. The healthy food fans will be able to enjoy a bowl of Greek yogurt with chia seeds. 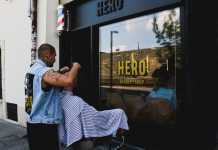 This stylish hip cafe can be found a few minutes walk from the main bus station. It is actually located in the Wustenrot building (therefore the name W Cafe), on the intersection of Grosslingova, Karadzicova street and Dostojevskeho rad. 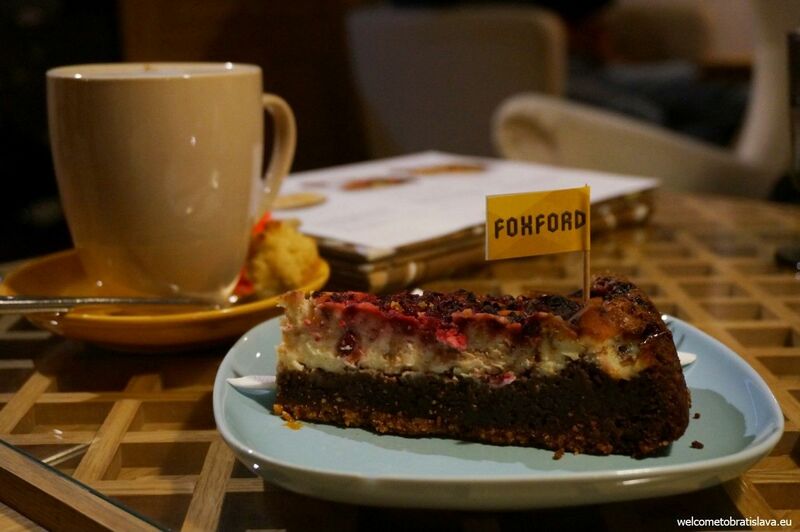 Foxford is not necessarily a breakfast place but offers nice and tasty options to have for breakfast. 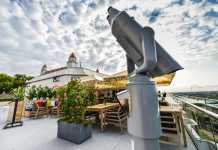 It has a great brand design with beautiful premises to enjoy yourself at. It is part of a bookstore and while the downstairs area has quite a busy atmosphere, the upstairs seating offers a great ambiance for working. We like to come here not only for the books but also because their cuisine offers healthy and non-traditional dishes and delicious cakes. 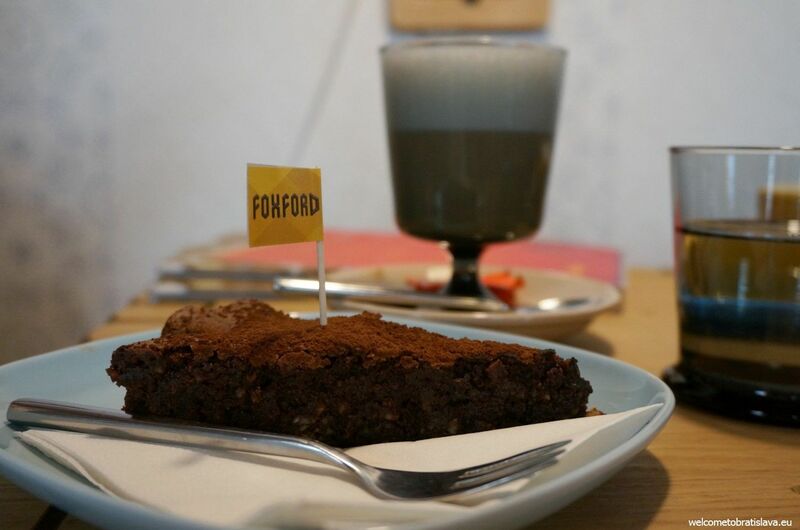 Their fantastic chocolate brownie with prunes is best with a hot cappuccino, and one of the most delicate cakes we have tried at Foxford was the creamy raspberry & chocolate brownie – a great mixture of sweet and savour taste, just delicious! It makes you want to order another one after you finish it :) Their cakes menu varies from time to time, usually according to the season. 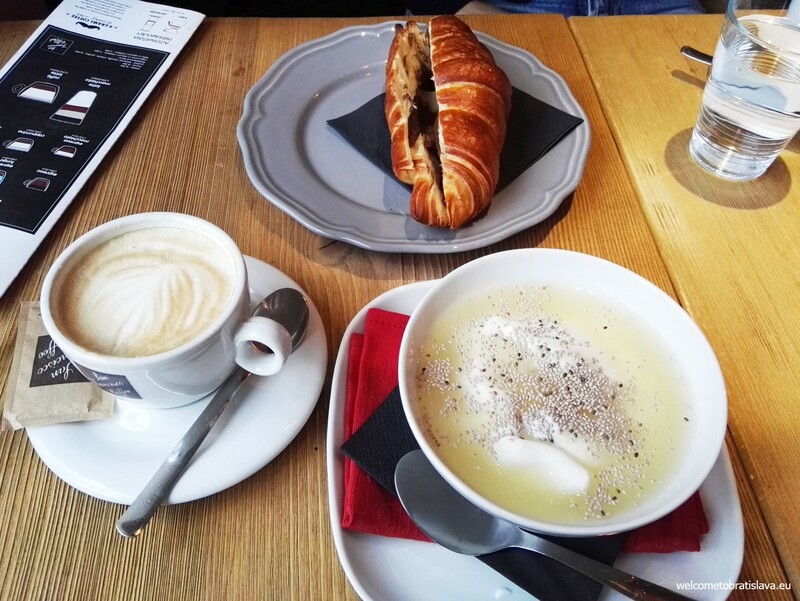 Feeling like having a French styled breakfast? No problem! You can have a plain butter croissant or mix it with jam or chocolate – orange spread. Those who prefer lighter meals can pick some of their flavored Greek yogurts. They have many kinds of small sandwiches which you can combine depending on how hungry you are. The menu is quite long, full of tasty vegetarian as well as non-vegetarian dishes. 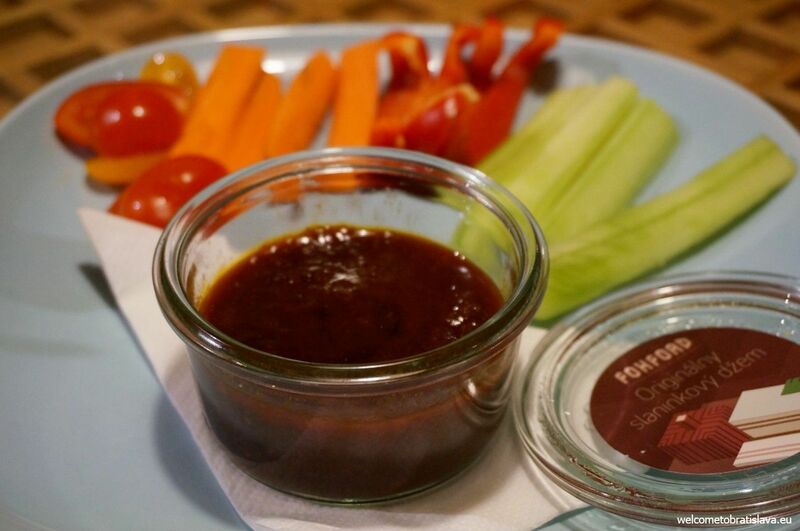 One of the most delicious spreads or jams is their bacon jam which can be served with vegetables or bread. 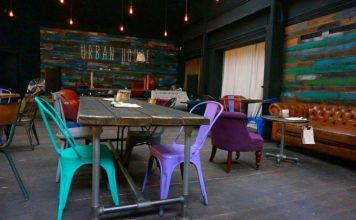 This place glows with colors, has a very friendly vibe and you just feel like home immediately! It is probably because it is decorated in the spirit of its coexistence with the bookshop and you can enjoy your coffee under the book pages hanging from the ceiling or pinned to the lamps. 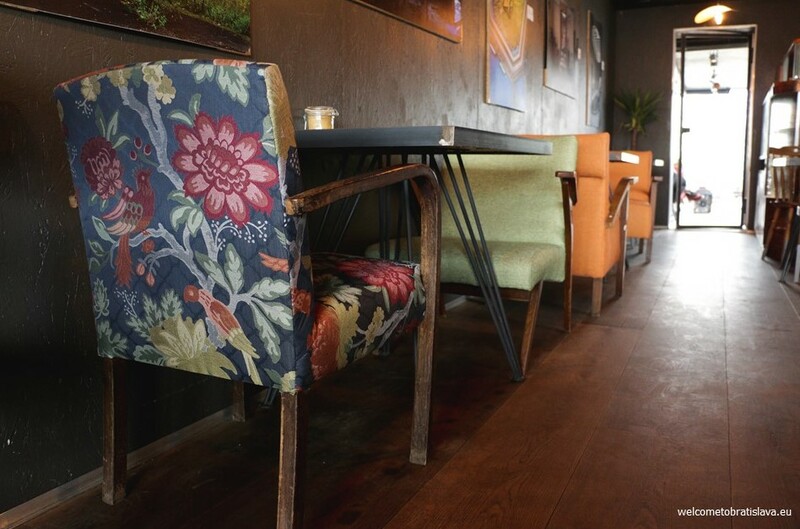 A cosy cafe with relaxed atmosphere, beautifully presented in a comfy style. The service is friendly and the food is tasty – you can stop by not only for breakfast, but also for lunch, dessert, a cup of coffee or a drink – they have it all. The menu contains healthy dishes using quinoa, bulgur, millet and other protein based grains. For sugar craving guests, they serve cakes both delicious and pretty to look at. 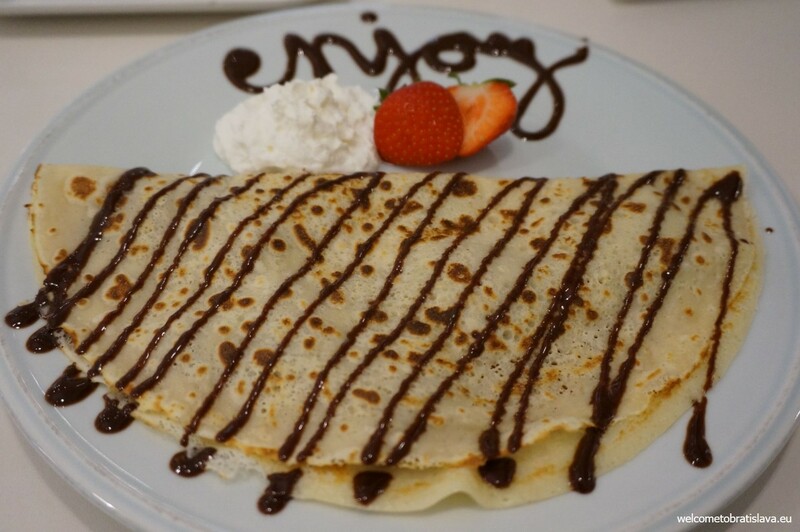 We have tried their pancake filled with chestnut puree and whipped cream and sweet rice porridge with wild berries – both were pampering our taste buds. You can also try scrambled eggs with bacon and baked mushrooms, home-made muesli with yogurt and fresh fruits, buckwheat porridge with maple syrup, almonds and banana or oats and spelt porridge with almond milk, cinnamon and cocoa. You cannot go wrong with simple butter croissant, the one with chocolate or home-made jam. With its pure lines, white and grey combinations and many small decorative details, ENJOY Coffee has great charm and style. The prevalent color is white which gives the place elegant nobleness. The designer tried hard when putting together the concept. 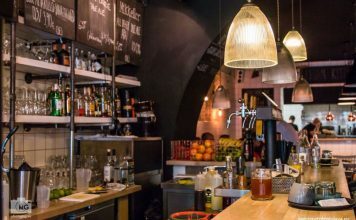 Five points Specialty Coffee offers a local artisan coffee in the very heart of Bratislava’s Old Town – on Panská Street, which used to be the best address in town housing the Hungarian aristocracy in the past. 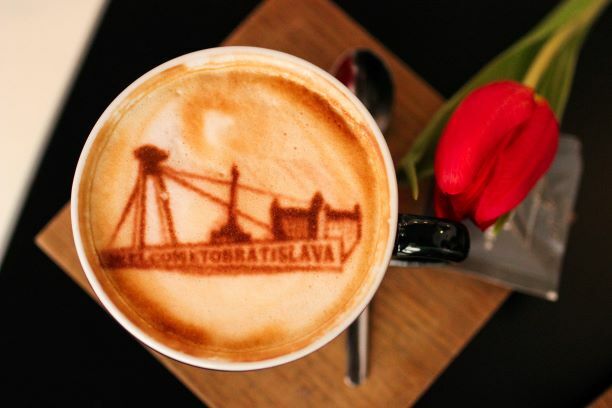 It offers Slovak coffee brand 9 grams that is based on American style roasting. 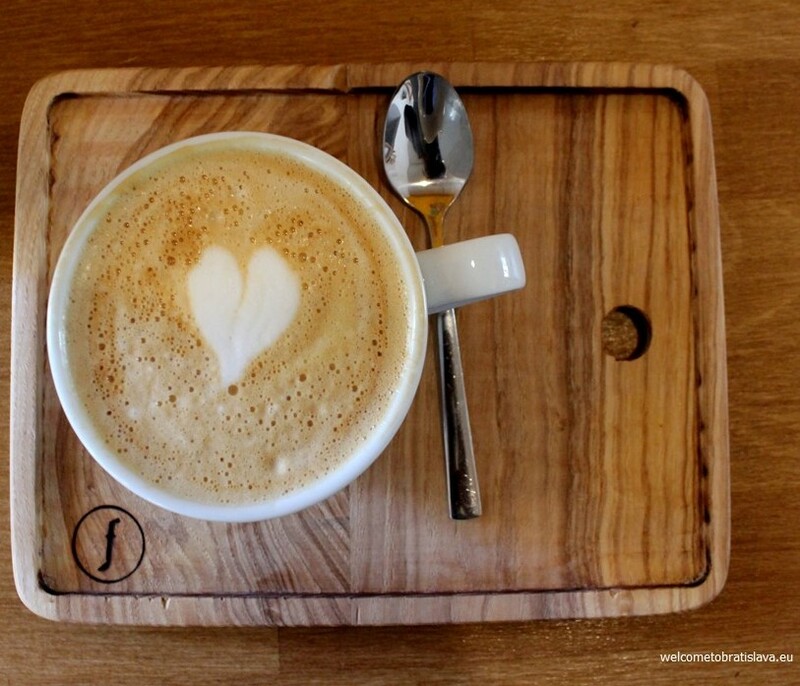 You can start your day with a proper energy boost at this place! Apart from the traditional coffee styles, they are especially proud of the alternative coffee making techniques such as an Arabic sand coffee prepared in cezve, vacuum pot coffee or a selfieccino – a cappuccino with a photo printed using cocoa-coffee-cinnamon powder. The place opens at 8 am each day including the weekends – perfect if you are an early bird. We love their breakfast menu that offers the usual breakfast meals that are, however, prepared with an innovative twist. Try for example their scrambled eggs with salmon or a bagel with bacon and poached egg. These were our top choices here. English breakfast with poached eggs was a good choice, too. We just wished the sausages were a bit less spicy. The salmon bagel was a satisfying meal, just note that the side salad is served with balsamico – not everyone likes it. FACH’s concept supports local ingredients and seasonal and region-oriented cuisine. Get ready for the simple dishes which are full of strong flavours. This is how the cuisine in FACH has been defined by its former head chef who returned to Slovakia after working in various Michelin starred restaurants abroad. The chef had changed since but the concept stayed. The breakfast menu is not overwhelmingly wide but everyone will find a tasty option here. It is served every day until 14:00. 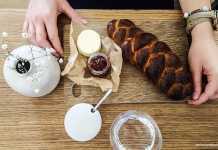 We love their own stone-baked bread from sourdough. 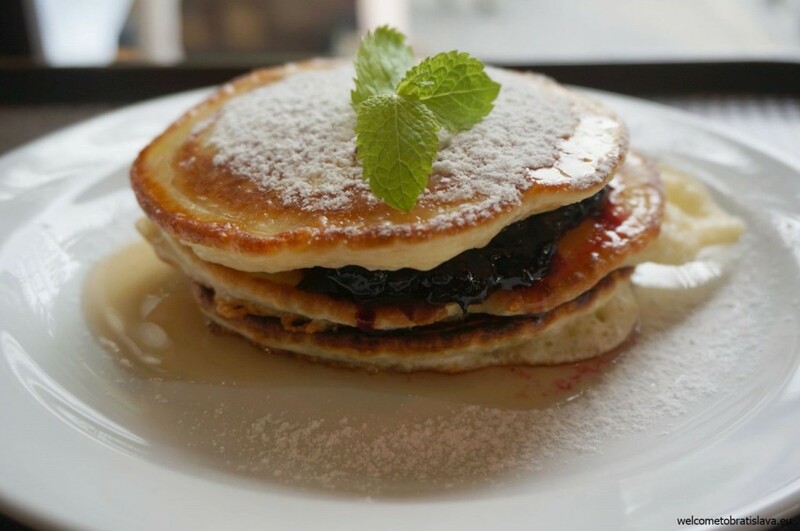 The sweet lovers will enjoy the sourdough pancakes with berries, vanilla and crème fraîche. We also enjoyed the poached eggs with béarnaise sauce and bacon served on a bread. We are indeed big fans of the clean, casual and in the same time elegant combinations styled in the Scandinavian design and this is exactly the case with FACH. In the end, you don’t need excessive furniture or accessories. It’s the food that you come here for. 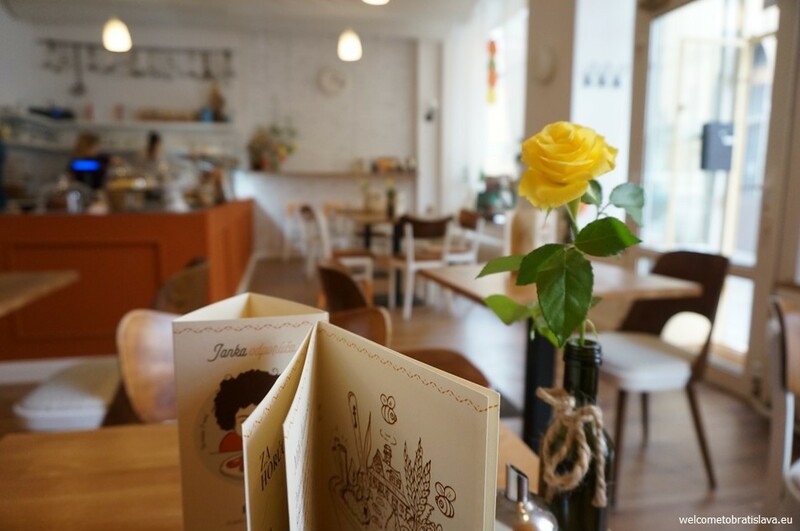 Zufana is a lovely bistro situated outside of Old Town, specialising in traditional Slovak cuisine with modern and often healthy twist. Established by three young friends, it serves as a kind of a community centre which is nowadays very popular mostly among Slovaks. You can see young families with babies or older children visiting regularly during weekends for a tasty breakfast. So, what not to miss? 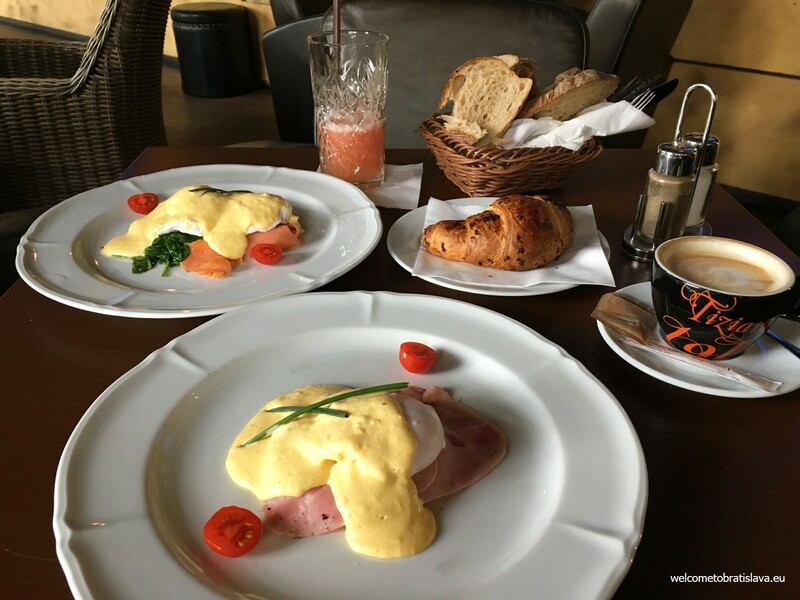 The first group of the breakfast menu can be called „traditional Slovak breaky“. You can have the best scrambled eggs with roasted onion, tasting like made at home by a Slovak mom. They also offer true boiled Slovak sausages („párky“) or very Slovak „chleba vo vajci“ which stands for a bread covered in egg – a truly tasty dish but not very healthy :) Our favourite is also the sweet grits porridge (“krupicová kaša”) topped with melted butter and sprinkled with “granko” (a Slovak version of cocoa powder with sugar). Granko is an ingredient used also for a hot drink “kakao” when poured into warm milk and you can also have it in Zufana. The second group of breakfast options consists of healthier porridges. Changing on a daily basis, there are always two different porridges on the menu – usually a rice version or a grains/oats/buckwheat one, with different berries, dried fruits or other ingredients combined. Third option are cakes – they have different types changing daily and usually the options are either healthier types or traditional Slovak ones. By the way, the name Zufana is a Slovak archaic or perhaps vernacular term for a scoop. 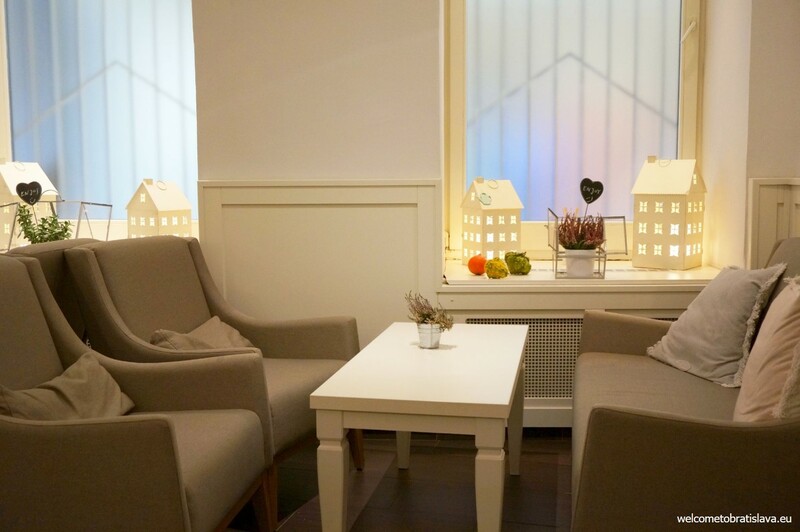 We also like the sunny and bright premises with nice small decorations. The place is children friendly – there is a children’ corner with toys and a changing table for babies. Ideal for a weekend family breakfast! And dogs are welcome too. 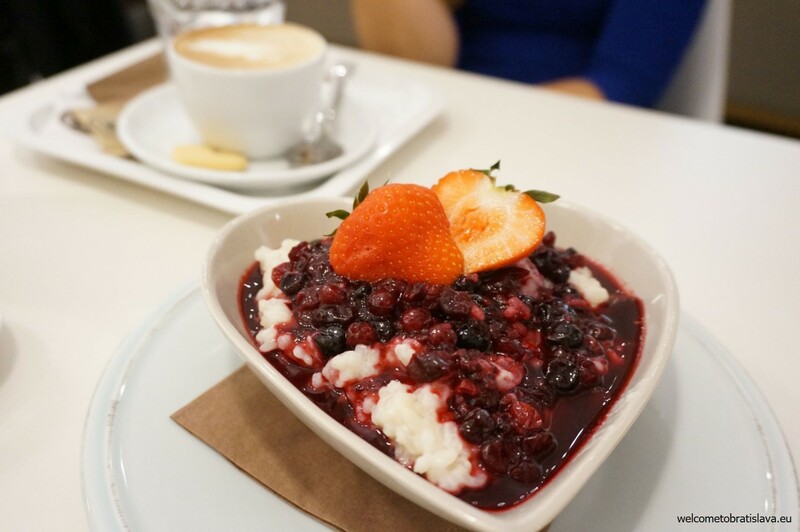 Varila kašičku is a breakfast love affair for all those who cannot imagine starting their day without a bowl of good porridge. 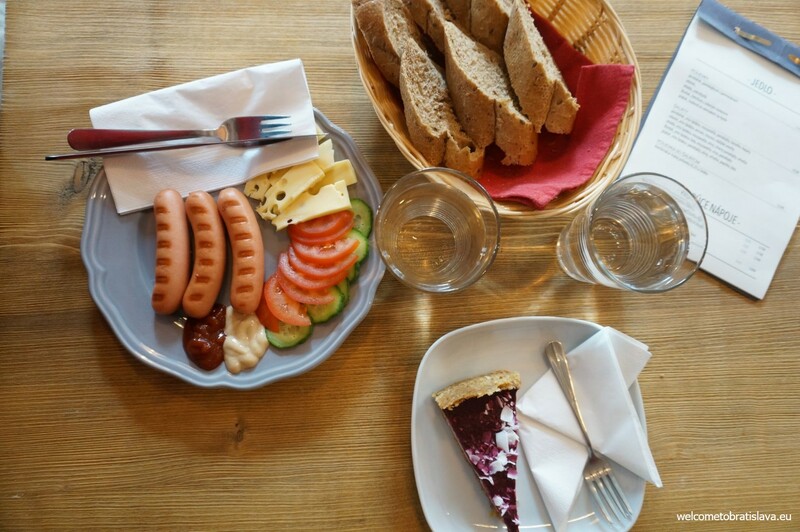 Located in the popular farmers market Freshmarket in the municipality Ružinov, Brunchbar Varila kašičku serves porridges from 7:30 in the morning. You can choose either a rice or an oatmeal version, both cooked for several hours with water only – meaning without any milk. There are two bowl sizes available (250 and 400 ml) and you can combine the ingredients based on your own preferences – up to 4 toppings within the price and more than 20 ingredients to choose from. Wanna have it sweeter? Add honey or coconut sugar which are at your disposal on the counter for free. 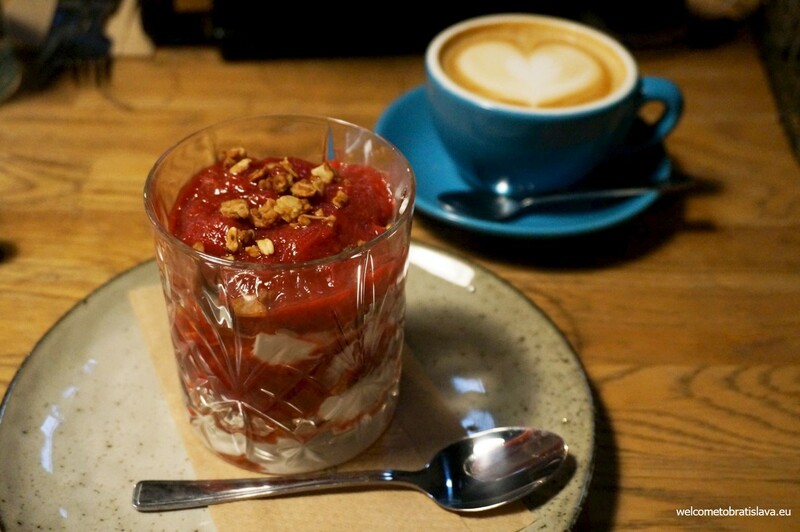 Good idea is to have a cup of nice coffee directly from the roastery to perfectly match your sweet treat. And how did we like our meal here? We chose the bigger portion and had trouble finishing it – was really huge! 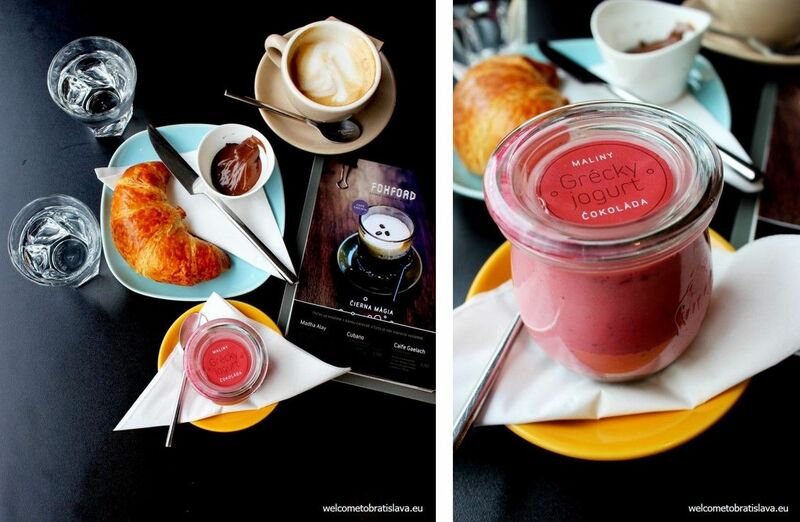 For those who love their breakfast the sweet way, this is the right place to go. We recommend this place especially to families with kids, as they have a nice tiny corner for the little ones (needless to say that in addition, there is a bigger children’s area in Freshmarket’s food court upstairs). Regulars may want to consider collecting stamps. Once you get five, your sixth meal is from free! 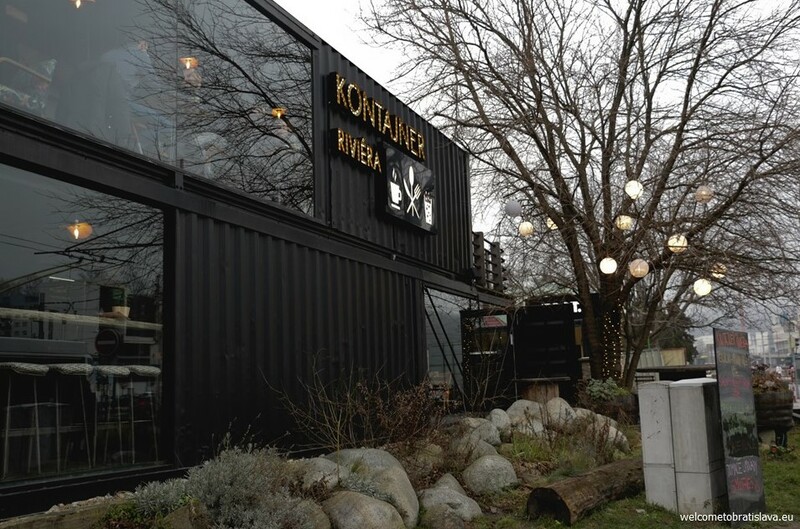 If you fancy non-traditional concepts, try this place – a restaurant and a cafe in a shipping container! You will need to travel outside of the city center though, as it stands at the beginning of Karlova Ves. This is the hotspot for all the local hipsters avoiding the city center! We love the cuisine of this place and moreover, they have a wide and amazing breakfast menu. And what is the best, in most cases, you can order breakfast even in the late afternoon hours. For example, the scrambled eggs with ham and onions were amazing and the bread served with basically all the salty breakfast meals was great. 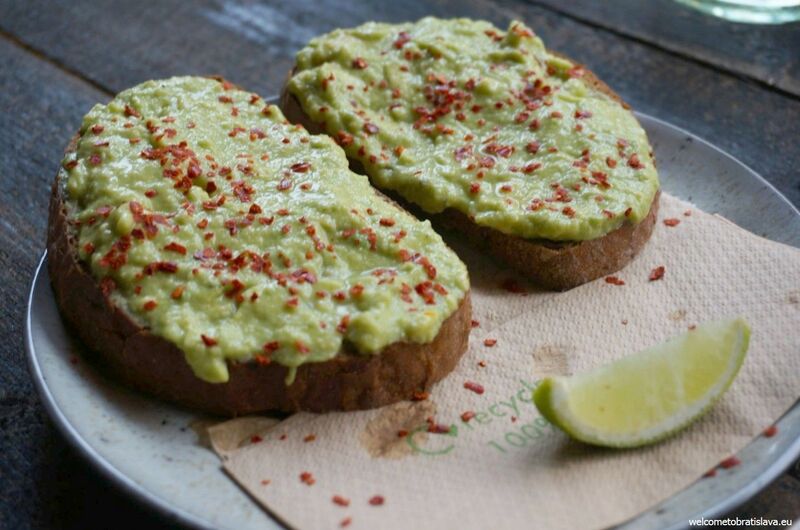 The same goes for the avocado with bacon and eggs – we loved it! The oškvarková spread was love at first sight, highly recommended! We also tried the sweet cocoa porridge with the hazelnuts and strawberries – the hazelnuts had a pretty strong base in this dish and took control over the flavors of the other ingredients. Local tip: Too many options to choose from? Let us save your time and worrie with a personalized travel plan which you can custom-build according to your travel times, budget and other preferences! We wil have a link change agreement betweeen us! I have read some just right stuff here. Definitely worth bookmarking for revisiting. I surprise how a lot attempt you place to make this kind of wonderful informative site. I really like reading through a post that can make peeople think. Couldn’t have asked for a better & more informative blog than this. It doesn’t get any better. Great job to whichever amazing person who spent some time to write this! Having recently returned home to the UK from five days in the wonderful city that is Bratislava, I can only describe “Ranno Ptaca” as breakfast heaven ! I went three times in three days, the breakfast burrito’s were amazing. Hi Suzanne, thanks a lot! I am really happy I could be helpful! This is a really great list, Maria. Thanks for both the photos as well as the detailed coffee report. 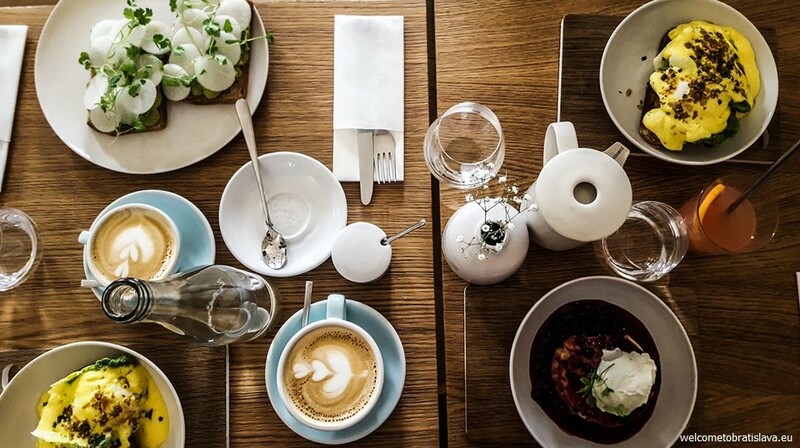 There’s nothing worse than bad coffee with good food in the morning. Ruins a good breakfast.